I love this quote from finance guru, Dave Ramsey. And it applies to selling just as much as it applies to personal finance strategies and ... life in general. For customers, every significant buying decision is like a balancing act. Imagine two scales. On one side is THE PAIN OF WHERE THEY ARE NOW. On the other side is THE PAIN OF CHANGE. As a salesperson, you have to tip the scales. You must show the prospect that THE PAIN OF WHERE THEY ARE NOW is worse (more painful) than the hassle, burden or PAIN that may potentially come along with the process of changing. When you're selling a product or service, one of the biggest hurdles you have to overcome is inertia. That is, getting people to MOVE... take action... make a decision. Often times, their hesitation may have nothing to do with you or the quality of your product or service. It may simply be that either they are reluctant to the idea of change (I've always used Brand X), or maybe they just don't want to put forth the effort (switching insurance agencies to get a lower rate makes sense, but is it worth the hassle?). Here's a good way to look at it... Imagine every customer asking the question, "Do the benefits received outweigh the burdens endured?" Most customers are thinking this, but never actually ask. So engineer your sales approach around answering that unspoken question. As you know, most people don't like change. They delay making a decision because doing nothing and sticking with what they've always done is easier. It's the path of least resistance. It allows them to stay inside their comfort zone. As a salesperson, your job is to overcome that inertia and get them to move. And that involves helping them get out of their own way! Deep down they want to buy, but pulling the trigger is often the hardest part. It's like a person standing on the edge of a diving board... sometimes all they need to take the plunge is a little reassurance and encouragement! To do this, you have to create discomfort / dissatisfaction. Create an uncomfortable itch for the customer (associate that discomfort with their current situation), then offer them a low-risk, hassle-free solution. The more you can associate low-risk, low-hassle with your product/service, the more likely they are to buy. In sales, it's really not about having a slick sales pitch packed full of features and benefits... it's more about positioning yourself as the low risk, low hassle, easy, and convenient solution to their current "problem". "This machine comes with a patented NO-SHAKE SYSTEM, which means it vibrates 50% less than conventional washing machines. And it has a built-in Power Steamer, which gently steams your clothes, giving you whiter whites and less wrinkles!" By this time, the customer's defenses are up. She feels like she's being sold. And if she's like most people these days, she already did her research on the Internet (and probably knows more about this particular product than the salesman). But the salesman was so anxious to jump into his "pitch" that he failed to get to the heart of the matter. That is, "What's wrong with your old machine?" Once the lady lists all the things wrong with her "old" machine, she is well on the way to selling herself. The PAIN OF WHERE SHE IS NOW has been reinforced. And the salesman didn't pitch anything! He just asked one simple question. A question that uncovered the PAIN that brought her into the store. Once you've answered her questions, begin removing the natural fears, worries, and hesitations that come with making significant purchase decisions. Reduce the PAIN OF CHANGE. Make owning this new machine easy. In this case, that may be offering to remove her old machine. Or it may be offering to install the new machine. Or it may be 12 months no interest financing. Or it may be an extended warranty. 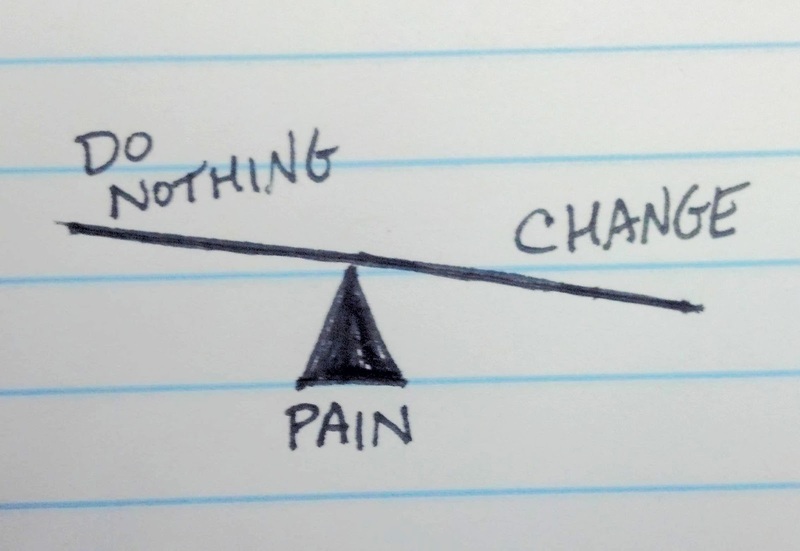 Do whatever you can to lessen THE PAIN OF CHANGE (the pain of making a decision). Remove the hurdles. Ease her mind. Solve her problem. Make the sale. Again, it's all about positioning yourself as the low risk, low hassle, easy solution. So many sales people pile on the features and benefits when all they really need to do is ask the customer "Where does it hurt?" Then show them how to ease the pain.